After taking my kids to pet the dolphins, kiss the sea lions, and watch the killer whales at a marine mammal theme park in Florida, I was told I have to see the documentary Blackfish. For anyone unfamiliar with the film, it is a film that follows the history of 3 deaths associated with Tilikum, a captive killer whale, along with the history and context of other captive killer whales. It shows sailors (with big beards and tattoos) crying over how sad it was to take the baby whales (adult whales were too large to transport) from their families in the wild. There are scenes of whales who have been “raked”, meaning scraped by the aggression of other whales’ teeth, attributed to the close quarters of their tanks not allowing them to flee. It tells stories of these socially advanced marine mammals being confined from the other whales or being placed in tiny pools. The film has a number of trainers of these whales interviewed describing their sadness in seeing the treatment of these creatures. And it even describes mother whales moaning when their babies were taken away from them. It tells about the life span of killer whales being only half or a third as long in captivity as they are in the wild, and all sorts of other gut wrenching facts. Needless to say, I had newfound dismay with our innocent trip to see these sea creatures! But I decided to continue my explorations beyond the documentary. I believe in trying to judge everyone favorably, and I felt the least I can do is give my childhood-idealized theme parks a chance to defend themselves. I soon found major research-based responses to practically everything I found so disturbing in the documentary. Killer whales have not been taken from the wild since the ‘70s. Raking happens in the wild as well. 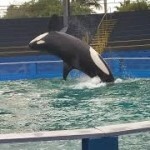 The parks with tiny pools are no longer active and often whales are separated to protect them when being attacked by their “comrades.” There is a multitude of trainers who vehemently disagree with the film’s depictions, including some of the people interviewed in the film claiming their words were taken out of context! The “baby whales” were only taken from their mothers after already many years fully grown with babies of their own which were actually transferred with them. And many of the “facts” about moaning, expected lifespan, and even accusations of these creatures being traumatized to the point of becoming psychotic murderous creatures were speculations and unfounded in research or facts. So now what do I do with all this? Well, as a rabbi, I see truth. No, I don’t see any truth in how to decipher which side to believe. I don’t think most of us will really know a full truth about Orcas in captivity, and I have no personal claim in any direction on the topic. However, there is an important truth that I do claim we can learn from the two sides presented here in understanding the human psyche. We are inclined to believe what we hear and see. When something is presented to us, especially when presented emotionally and with conviction, we are inclined to believe it. And then we become impassioned about it! We’ll even start to take action based on the passions we now feel. Sadly, we often skip an integral step of asking ourselves a simple question, “Is that really true?” Is the perception I am being fed the actual truth of what happened? It can be slightly daunting to tell our kindled emotions to slow down for a minute as we intellectually process the validity to what is being presented. If asked, we would all claim to be truth-seekers. But in order to truly seek truth, we have to sometimes give truth-seeking credence even beyond our emotions.